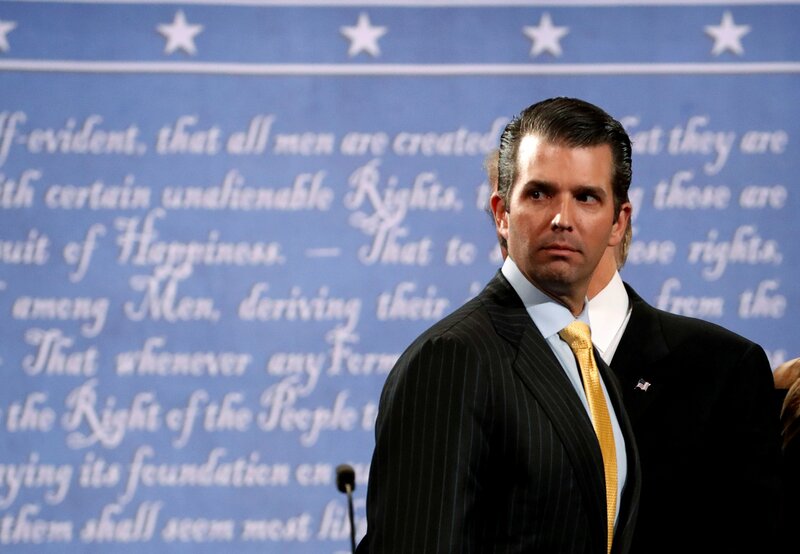 Donald Trump Jr. used Hillary Clinton's birthday on Thursday as an opportunity to take a dig at the former Democratic presidential nominee calling her out for her hubris in a tweet in 2016 announcing herself as the future president. "A year later the arrogance and entitlement in this tweet is exactly why it was never going to happen," President Donald Trump's eldest son said. He added an image of the tweet Clinton had posted ayear ago that showed her as a young girl. "Happy birthday to this future president," she wrote at the time. Clinton sent the tweet less than two weeks before the November 8 election that propelled Trump to the White House. At the time she was riding high in the polls. Trump Jr. has made frequent media appearances in defence of his father's administration over the last year. Earlier this month he attacked the media for its reaction to the president's handling of the race-related violence in Charlottesville, Virginia in August. "He condemned...the white nationalists and the left-wingers. That should not have been controversial, but it was," Trump told a gathering at Faulkner University in Alabama. However, Trump's eldest son has grabbed the most press attention over his desire to get dirt on Clinton. He has become a person of interest in the probe into Russian interference in the U.S. election after he met with a Kremlin-linked lawyer hoping to get damaging information about his father's former presidential rival. Over five hours of questioning in September by the Senate Judiciary, lawmakers probed Trump Jr. over the June 2016 meeting and its fallout. He denied the president's aides had been involved in drafting a statement to The New York Times over the memo. Trump, who in emails was shown to have responded "If it's what you say I love it especially later in the summer," to overtures by the lawyer, Natalia Veselnitskaya, through a family associate, told investigators that he had felt conflicted about going to the meeting. According to the Times he explained away the events as part of the chaos of the presidential campaign, rather than a concerted effort to work with Russia. Ultimately Trump Jr. has said the meeting amounted to nothing. "As it later turned out, my skepticism was justified," he told investigators in September. "The meeting provided no meaningful information and turned out not to be about what had been represented," he added.